You can see the quote in context in Kevin Jackson's blog on FLOATING. I fully support Kevin. I worked for a ticketing agency and there is a services fee that is ALREADY included in the ticket price. The booking fee is an on-top margin to cover other expenses like promotion and venue maitenance. Its ridiculous. I often go to the theatre by myself and try to purchase the 'cheap seats'. More charges and price hikes only continues to marginalise the theatre viewing public and once we start to segregate the audience, we will start to constrict the material. A $5 cost on the price of the tickets to cover extra opening hours??? Who are they kidding? The House is behaving like a bank, slugging the client for a service that should be part of the normal operation of the House's business. This is price gouging by another name and should be roundly condemned. What next - an extra fee to cover the wear and tear of the fabric of the seats we sit on when attending a show? If I've made the effort to go to the box-office in person where is the justifiable extra cost? The person serving me is already being paid, the tickets would have to be printed anyway etc etc. Another case of arts administrators being far removed from the business of art or, in other words 'When we say Art, we (really) mean Business'. I guess this means that next time I'm at the greengrocer's he can say to me 'The apple is 50 cents but there will be a 10 cent fee for me to hand it to you because I've decided to stay open for an extra hour on Thursdays'. Shame on the SOH. It's a joke! A joke! And the explanation is unreasonable. Ticketing agencies, theatre companies, promoters and venues should have to incorporate those costs into the advertised ticket price. There should be legislation to enforce it. It stinks of false advertising to me. Always has. This SOH example is particularly bad. Thank you Kevin for bringing this issue into the open. 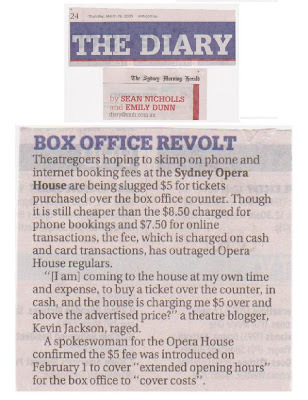 I appreciate the Opera House responding however it is unfair and as Samantha has commented the service fee is already in the ticket price. Poor rewards for your effort of purchasing directly on the night. Aside from discussion it was a wonderful review of Floating. "THE State Government has agreed to fund a $1 billion project to finally bring the Sydney Opera House in line with its designer's vision."